A cordial atmosphere in a simple and elegant environment welcomes the guests of the Hotel Santa Lucia, one of the best 1 star hotels in Venice. Well cared for by its owners that have been running the hotel for more than 40 years, it is more than can be expected from a 1 star hotel in Venice. A nice garden (a real rarity for a hotel in Venice!) 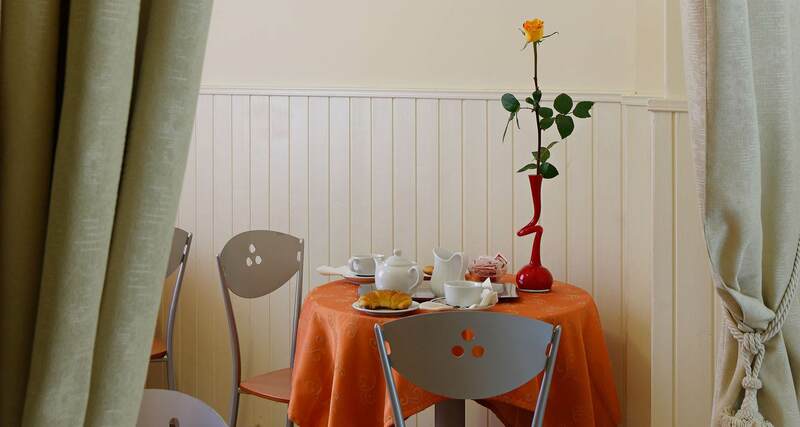 surrounds the hotel, and becomes a pleasant place for breakfast during the right season of the year, served at your table with plenty of bread, jam and butter, croissants, as well as fruit juices, espresso coffee, cappucino, American coffee, etc. At the reception (24h) of the Hotel Santa Lucia, guests can find useful tourist information for getting around the labyrinth of calli and rii of Venice and a calendar of exhibitions and events in the city. Near the hotel you can also find the quiet and relaxing Parco Ca’ Savorgnan, a good spot for a relaxing break between sightseeing visits, and it is just 1 minute away from the exchange office, a laundry that is open night and day, and an Internet point.